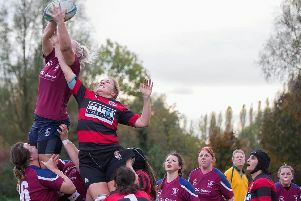 Olney cruised into the fourth round of the Midlands Cup with a 40-10 win over Coventrians. The home side had reached this stage via a bye in the first round and the opposition withdrawing from the second round. Olney kicked off and Covs. returned the ball to touch o halfway. The initial encounters were probing attempts to test the defenders on both sides. The first score went to the home side, Olney won the ball at a line out on the visitor's '22' and opted to use the blind side. Winger, Harry James, used his pace to evade the defence and touch down near the corner. Jordan Letts was successful with the conversion from wide out to make it 7-0 after 10 minutes. Covs. attacked from the restart and gained a free kick that was put into touch on Olney's '22'. Olney won the lineout and kicked long to take play into the visitor's '22'. The visitors made good use of their backline and gained ground . They were denied possession when they lost control of the wet ball. It was throwing it down! They had reached within 5m. of the Olney goal line! Olney moved the ball away from the danger area but a knock on gave Covs. a scrum on the home '22'. 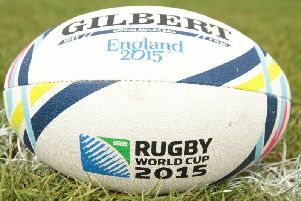 The visitors won the ball and ran in a try near the corner, scored by Elliot Sheepy for 7-5. Olney kicked off and Covs. put the ball into touch on their own '22' . Olney's line out was working well, much better than last week! They won the ball and moved it to their backline. At the breakdown Covs. were penalised and Olney took the scrum option. They won the ball and ran it, on the blind side. The visitors wrested the ball from the home forwards but their attempted clearance was picked up by the Olney backline. They moved the ball to Letts at '10' who placed a perfect crosskick to Jake Deighton, in the left wing position, who touched it down. Letts rounded it off with another fine conversion kick to extend the lead to 14-5 after 32 mins. Covs. kicked off and their pack followed up, claiming the ball in the loose. They were awarded a penalty and kicked to touch. The line out was followed by a another penalty to the visitors and Olney were committed to some serious defending. A brace of penalties against Covs. took the pressure off the home side and they managed to carry the ball into the visitor's half. The young Olney backline were successful again when Stu Livesey jinked through Cov's. defence then, turning on his overdrive, scored under the posts. Letts added the conversion as Olney went in 21-5. Coventrians kicked off for the second half and with a man offside gave Olney a scrum on the centre spot. They won the ball but knocked on in the threes. Covs. won the ball at their scrum and fed the backs who knocked on! Eventually the ball was put into touch for a line out on Olney's '22' , Olney's throw in. They won the ball , attacked and Knocked on! The knocking on was interrupted for a penalty to Covs. on halfway. They put the ball into touch and at the lineout the home side were penalised again. This time Covs. ran the ball and managed to break through the Olney defence for a try in the corner, scored by Chas Hudson, for 21-10. The home side kicked off and were awarded a penalty, they ran the ball in their threes for Euan Irwin to score. The score was 28-10 after Letts converted. Covs. kicked off and gained a scrum for a knock on, they were further assisted being awarded a penalty that they ran, taking play into Olney's '22'. They were on a roll and for a period were camped in Olney's '22'. A knock on gave Olney put in at a scrum and took the heat off their defence. They made the most of the situation running the ball into Cov's. '22'. Letts finished the move with a try that he also converted to make it 35-10. Cov's restart kick was followed up taking play into Olney's '22'. A chip took the ball over the home goal line but was touched down by a defender giving Olney a '22'drop out. Jake Deighton chased and picked up the ball and evading the defenders to touch down. The conversion attempt was this time off target, but the 30-point lead was more than enough to see Olney through.